Twenty years ago today, on December 13, 1996, Jerry Maguire debuted at the box office. Tom Cruise played the titular sports agent (based on Leigh Steinberg), a loveable loser who has an epiphany and writes a long mission statement, sending himself into a career and personal crisis. The film won Cuba Gooding Jr. an Oscar, and blessed the world with such everlasting catchphrases as “You had me at hello,” “You complete me,” and “Show me the money.” Here are some “Kwan”-tastic facts about the Cameron Crowe dramedy. 1. THE LACKLUSTER SUCCESS OF SINGLES PROMPTED CROWE TO WRITE THE SCRIPT. 2. THE JERRY MAGUIRE ROLE WAS ORIGINALLY WRITTEN FOR TOM HANKS. 3. 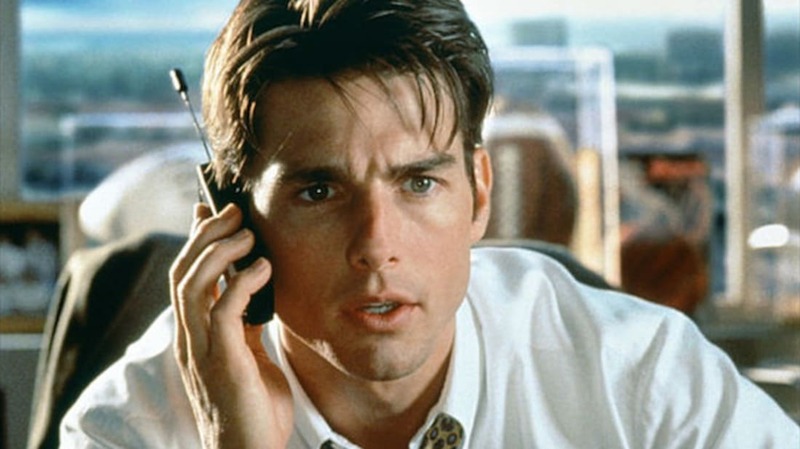 SEVERAL CLASSIC MOVIES—AND MY-SO-CALLED LIFE—INSPIRED JERRY MAGUIRE. “I wanted to write a movie with a real story, the kind that shows up on TV late at night, usually in black and white,” Crowe told The New York Times. Crowe loved filmmaker Billy Wilder so much, he tried to get him to play the Dicky Fox mentor role to no avail. But Crowe ended up basing the film around Wilder’s classic film The Apartment. 4. CUBA GOODING JR. GOT NAKED FOR HIS AUDITION WITH CRUISE. In a 1996 journal for Rolling Stone, Crowe recounted Gooding’s audition. Cruise and Gooding had worked together before in A Few Good Men, so Cruise was excited to reunite with him. Gooding and Cruise read the locker room scene: “Am I naked in this scene?” Gooding asked. “Yes,” Crowe responded. “Gooding snapped down his pants and stood naked,” Crowe writes. “‘Come on, let’s go,’ he said. Stunned and laughing, we watched as Gooding beckoned with his hands, as in, ‘Bring it on.’ ‘Come on, let’s read the scene,’ he shouted joyously. ‘I’m gonna get this part. I ain’t afraid of nothing.’” Gooding won the role, and because Gooding was slightly shorter than an average football player, Crowe rewrote the character description as a football player “who some felt was too short for the NFL." 5. THE ROLLING STONES’ RONNIE WOOD HAD A HAND IN NAMING BOB SUGAR. 6. RENÉE ZELLWEGER DIDN’T KNOW HOW TO SAY THE “HELLO” LINE. 7. THE CUTE LITTLE KID IS NOW GROWN UP AND IS A MIXED MARTIAL ARTS FIGHTER. Jonathan Lipnicki stole the movie as Dorothy’s precocious five-year-old son, Ray. Last year, “JLip” recorded a Father’s Day video thanking Jerry: “You kind of lost me at Kwan, but you had me at hello.” JLip goes on to poke fun at his role—“women would ovulate just looking at me”—and then rants how casting agents still think of him as the cute kid from the movie, even though he’s 26 years old. He also reveals he has a purple belt in Brazilian jiu-jitsu and that his body is, well, very ripped. So, he has that going for him. 8. CONNIE BRITTON WAS ALMOST CAST AS DOROTHY BOYD. 10. CUBA GOODING’S DAD WAS BANNED FROM THE MOVIE SET. 11. JERRY MAGUIRE IS THE FIFTH HIGHEST-GROSSING ROMANTIC DRAMA OF ALL TIME. The film had a budget of $50 million and grossed $273 million worldwide. Twenty years later, it ranks as number five on the list of blockbuster romantic dramas, just behind Fifty Shades of Grey (Titanic tops the list). Even though Jerry Maguire opened at number one, it ranks as the lowest-grossing number one film, on weekends where the top movie made less than $10 million. This occurred during its fourth weekend, when it grossed only $5 million. After 1997, because of increasing ticket prices, the sub-$10 million trend stopped being tracked. 12. CUBA GOODING DID ALL HIS OWN STUNTS IN THE MOVIE, AND HAS A BACKGROUND IN BREAKDANCING. On The Graham Norton Show, Gooding Jr. said he was one of the young dancers who performed with Lionel Richie at the 1984 Olympics Closing Ceremonies, in Los Angeles. Gooding proved he still has the talent, when he showed off his windmills and other breakdance moves on the talk show. 13. THE HUMAN HEAD MAY OR MAY NOT WEIGH MORE THAN EIGHT POUNDS. Ray Boyd tells Jerry while in the backseat of a car, “Did you know the human head weighs eight pounds?” But is he right? According to a textbook and Brain Stuff, the human head actually weighs about 10 to 11 pounds, and the brain weighs about three pounds.